We’ve all seen plenty of heartbreaking images from Texas this weekend, as vicious floods continue to destroy lives and property in the wake of Hurricane Harvey. But some of the most chilling footage has been taken from the sky, as hobby drones in the region document the devastation that’s still taking place. Modern technology like social media and smartphone cameras now bring images of natural disasters to people around the world in an instant. And with this decade’s rise of drones, the bird’s eye view has become nearly as ubiquitous as any other. We’ve collected some of the footage taken in the past couple of days in and around Houston. Some of it is taken by drone pros, while other footage clearly shows amateurs who are still learning to use their drones. But pro or not, each clip is an important document of this historic natural disaster. If you want to help people on the ground, Houston Press has compiled a list of food banks in the area where you can donate. You can also donate to the Red Cross by text, but you should probably read up on their failures in Haiti (they raised half a billion dollars and built just 6 homes after the earthquake in 2010) before you do that. But help however you think is best. People are suffering and they’re going to be suffering for some time to come. Description: Drone video of Brays Bayou in Houston Texas on August 27, 2017. Taken during a break in the rain associated with tropical storm Harvey. Description: Houston Flooding in Energy Corridor at Eldridge Pkwy/Memorial Drive. Buffalo Bayou At the End. Description: Drone footage of #Harvey damage in Port Aransas Tx. 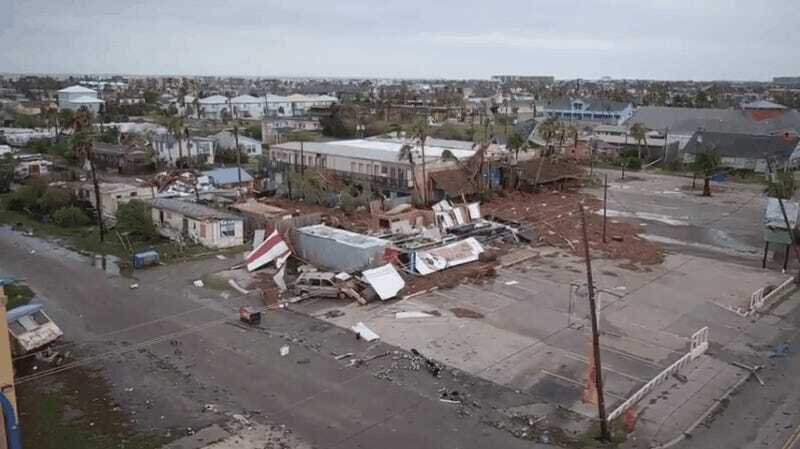 Description: Drone footage from Rockport, Texas, shows the destruction left behind by Hurricane Harvey. Description: Drone Footage Of Hurricane Harvey Flooding In Houston! Description: Some amateur shots taken with my drone of the Buffalo Bayou in west Houston on Briar Forest. Description: Drone video (Part 1) of Hurricane Harvey at The Texas Medical Center, Houston, TX by AirLuxe Studios.